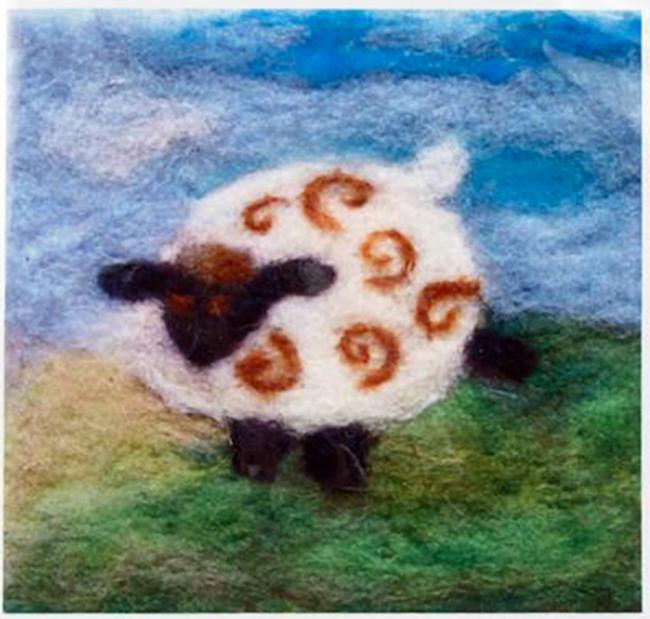 Ready to try your hand a needle felting, or looking for fun new designs? You’ll be delighted by the Thyme Tile Felting Kits! Made here in Maine at A Wrinkle in Thyme Farm, these charming designs are inspired by life on the land. Fun, affordable and fast-to-make, each Thyme Tile makes a square approximately 5″ x 5″ and includes the design and wool you’ll need to create the flat “painting style” image. Good news fiber artists! 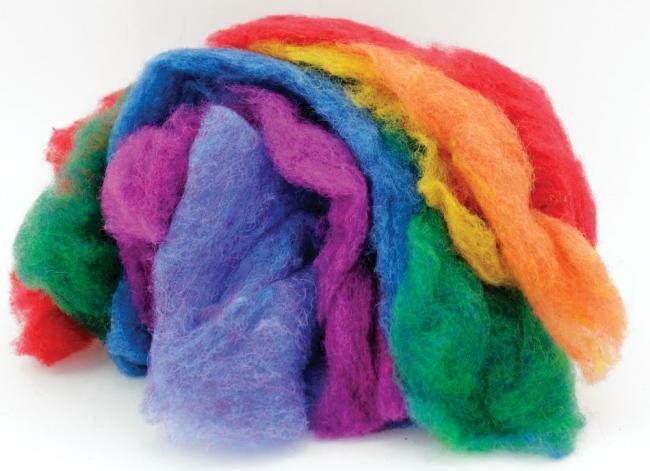 We know you love the Harrisville Dyed and Carded Wool Fiber for all your felting projects. After all, it’s a wonderful wool blend with touch of merino that comes in a staggering 56 different colors. Perfect for so many types of felted creations. The wonderful and multi-talented Rose, who many of you know from calling the shop or stopping by, is guest posting this week to share this great new fiber item she’s just gotten ready for you – enjoy! Spooky and sweet – felting kits perfect for fall! 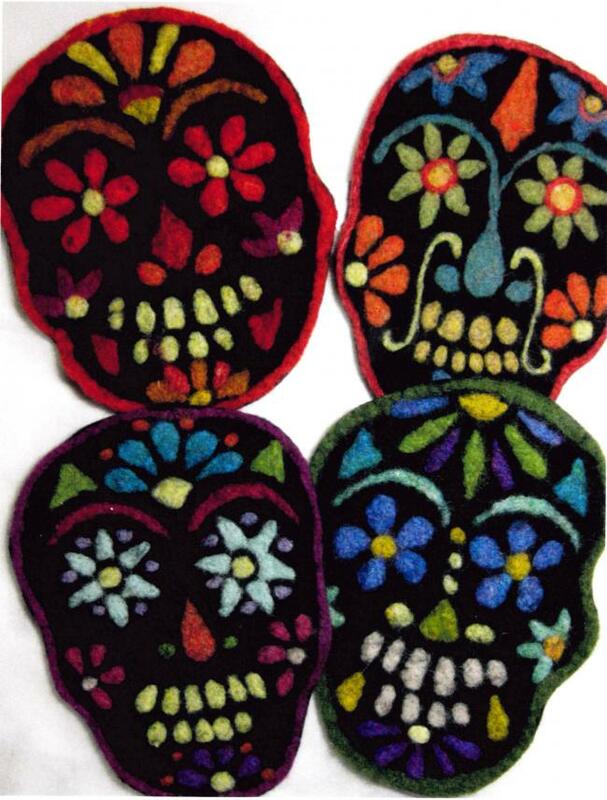 Sugar Skulls & Fuzzy Friends – Fantastic Felting Kits! Ornately decorated sugar skulls often adorn altars as part of the Mexican Dia de los Muertos celebration. Festivities begin on the evening of October 31st and last through November 2nd. It’s a time of reflection as well as celebration, when families reminisce and share offerings to the spirits of the dead. Lost loved ones are honored with altars that often feature fresh flowers, food, photographs and mementos, beautiful fabrics, candles, and vibrant sugar skulls. Each kit includes everything you need to make these beautiful felted wall hangings. Needle felting is easy to learn and these colorful 100% wool “tapestries” make wonderful wall hangings or can be used to decorate other items like a pillow covers or bags. Make them all for a whimsical woolen series! Looking for something a little cuddlier? 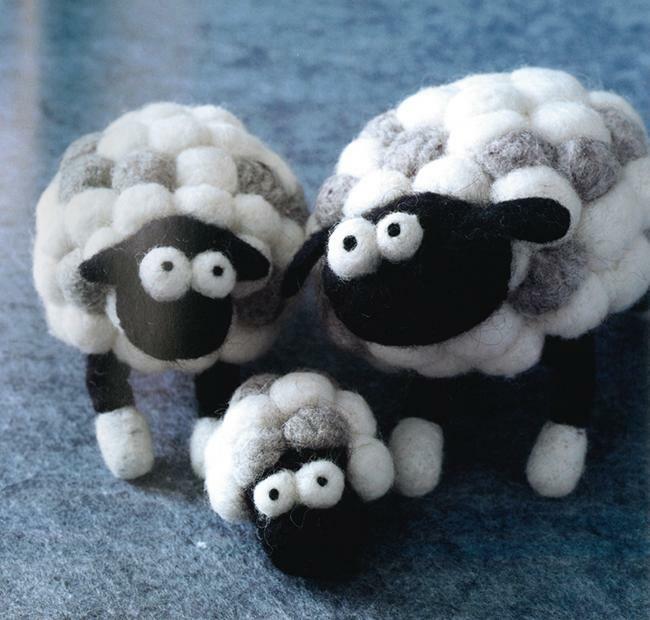 Try these adorable needle felted critters from Woolbuddy or Romney Ridge! Each kit contains instructions, fiber and needles to make the cute animals you see here. You’ll just need a pad or other work surface. These little felted sculptures make wonderful little home decor accents, and are especially great for handmade Christmas tree ornaments! Woolbuddies – back in stock! We’ve been carrying several of the Woolbuddies needle felting kits in the store for a while now—you know, those little woolly animals with the big googly eyes and bright colors? We recently restocked the how-to book [Sorry, item discontinued or temporarily out of stock] , written by the designer himself, Jackie Huang. WoolBuddies has step-by-step instructions and photographs to help you create your own adorable Woolbuddies! I know some people are intimidated by needle felting because it’s a very freeform craft. Pretty much all you have to do is repeatedly poke wool roving with a tiny barbed needle to create various shapes. Huang compares needle felting to sculpting with clay. There aren’t many hard and fast rules and you can make whatever you want! This is the perfect book for someone who wants to start needle felting but doesn’t know quite where to begin. It’s a guided approach to making a bunch of adorable woolly animals. But Huang also encourages readers to get creative with the craft. He wants you to feel free to change the color, the size, the animal, whatever, to really make it your own! 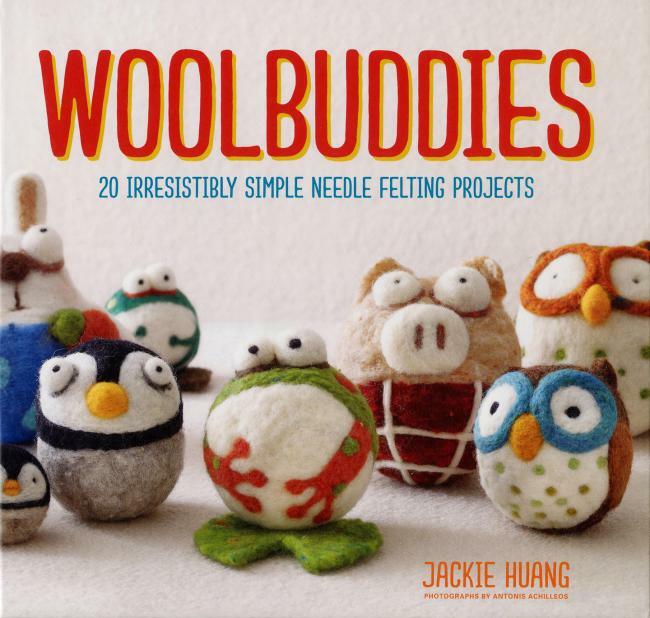 The book is also great for experienced needle felters who want the inside scoop on how the Woolbuddies are created. Before designing and creating Woolbuddies, Jackie Huang studied computer animation and worked as a 3-D story artist on the animated television series Star Wars: The Clone Wars. Woolbuddies started as a way for Huang to create durable, natural, handmade toys for his daughter. The Woolbuddy collection has over three hundred creatures, and this book has detailed instructions on how to make twenty of the best Woolbuddies designs. 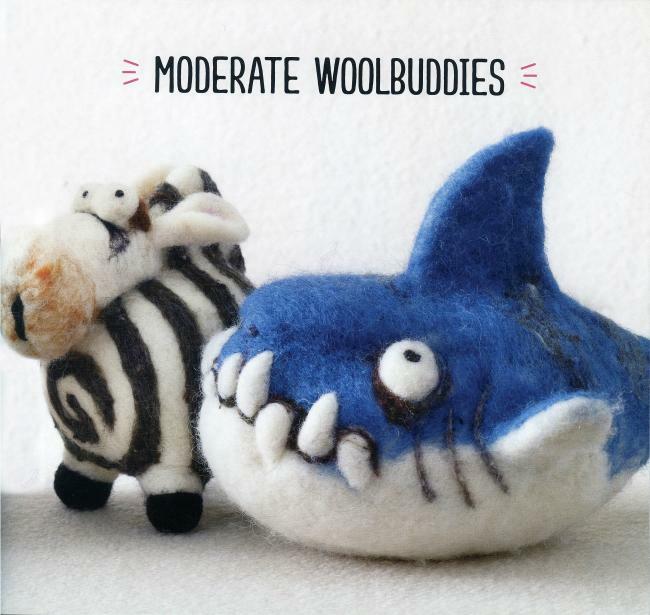 The book is divided into simple, moderate, and challenging Woolbuddies, though the author asserts that all needle felting is simple, it’s just that some projects will take longer to complete than others. Each character has a name, a little story, measurements, and materials needed. 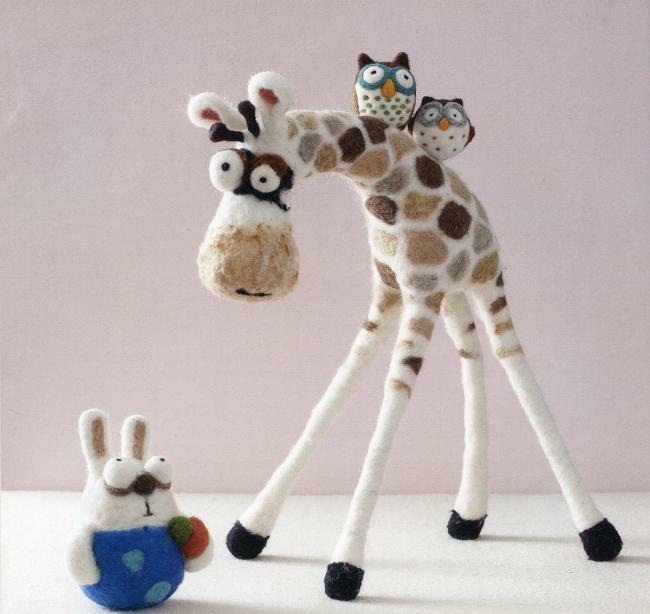 Some of my favorite projects are Shana the Penguin, which was actually Huang’s first Woolbuddy character, Eunice the Sheep, a roly-poly sheep made from a bunch of tiny felted balls, and Jimmy the Giraffe, who is over a foot tall and has posable legs due to an inner wire frame. In addition to the twenty projects, there are illustrated tutorials on fundamental techniques like making a basic body shape, making eyes, making a flat shape, and making a clean line between two colors. 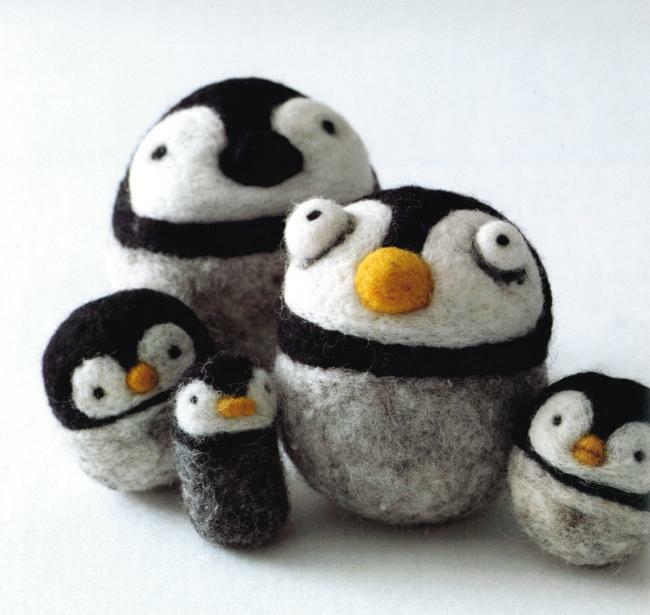 Needle felting is a great craft for all ages — though be sure to supervise children, because those needles are sharp! It also requires minimal materials! All you need are some felting needles, a foam mat or pad, and some fiber. Huang uses the Clover Pen Style Needle Felting Tool — which is my favorite as it holds one, two, or three needles at a time. For a great assortment of fiber to make some colorful Woolbuddies, check out these Felting Fibers: Ashford Fiber Bag or [Sorry, item discontinued or temporarily out of stock] and create your own variations on these amazing creatures! As we head into the holidays, these adorable woolly sculptures make great presents… The smaller ones are perfect for handmade tree ornaments! It’s just like Christmas each time a new batch of Pulled Sari Silk Fiber, 1/4 lb bag color 0000 arrives. Every box unveils silky fibers galore in an array of colors. We never know what to expect. What fun! This time around we have a subtle fiber base reminiscent of pinky, gray granite in which a whole host of other colors are intermixed. It’s sometimes tricky to envision just how these fibers will play out in different mediums so we’ve done a bit of experimenting. Take a look, see what you think, and then get creating. Need a little incentive? Remember, fiber doesn’t spoil so grab a bag or two to put away for a rainy day of playing with silk. We carded the Pulled Sari Silk Fiber with black, grey and white wool, spun a few yards, then knit tiny swatches. Those of you familiar with Peace Fleece Yarn will see similarities. A great yarn for cool weather accessories like hats, mitts, scarves and cowls. 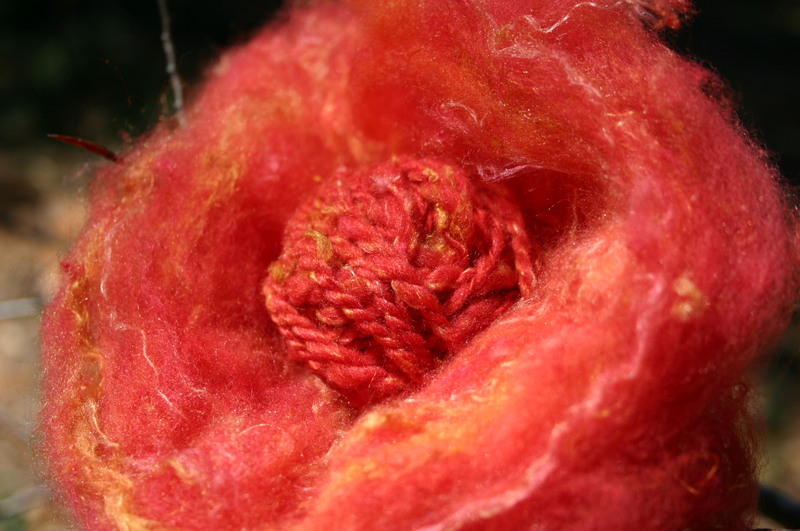 Up next… felting. A fine layer of silk on the outer layer of balls and beads produces wonderful results. How perfect for felted jewelry. My favorite felt sample is a thin layer of silk on top of magenta wool. I see gorgeous felted bags and hats in the future. Now that we’ve got you started, what will you create? Interweave’s new magazine [Sorry, item discontinued or temporarily out of stock] has just arrived. If you’ve ever been intrigued by the magical world of felting, this is the magazine for you. 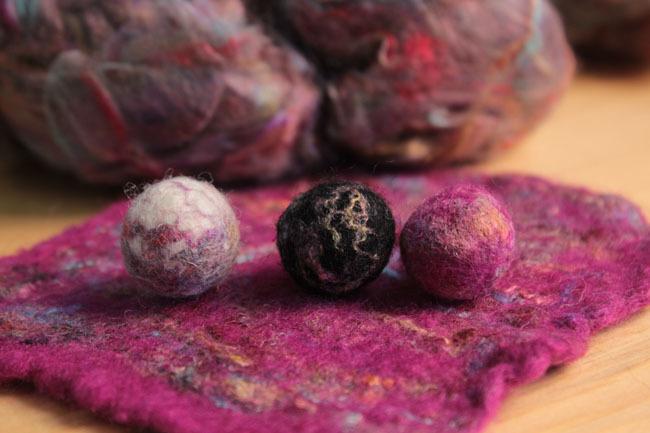 Felted explores all things felt from needle felting, nuno felting, traditional wet felting, stitching with commercially made felt to creating with recycled felt. There are 24 projects in all. So come see what the wonderful world of felting has to offer. 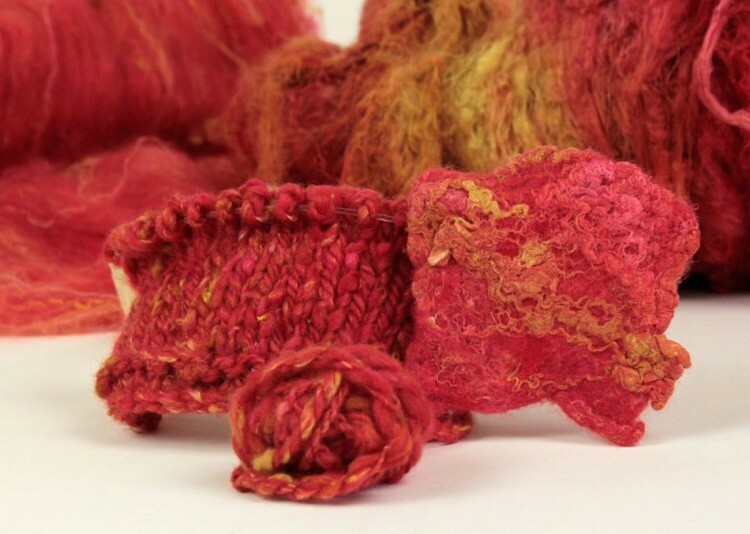 We have an intriguing new fiber at Halcyon Yarn ready to get your creative juices flowing. It’s *demi-carded silk bundles in white and fun, vibrant multi-colors. These luscious sheets of silk fiber are ready for carding and blending to create unique hand spun art yarns and fun and funky felted projects. Weavers, consider using pieces of the silk as innovative add-ins with your woven projects. Let the radiant colors of the demi-carded silk bundles be your inspiration to gather other fibers and goodies to create art batts. Then get the hand cards movin’ n’ grovin’ or the drum carder cranking (oh, and don’t forget the Ashford Blending Board). Be prepared to use a little extra muscle when blending non-traditional fibers. Also keep in mind if you want distinct colors within the art batt only card once. The more you blend the more uniform it will become. If you’ve not ventured into the world of art yarns, get ready for an eye opening adventure. From blending to the many specialty spinning techniques it’s 100% percent fun. If you need a little guidance [Sorry, item discontinued or temporarily out of stock] , [Sorry, item discontinued or temporarily out of stock] and [Sorry, item discontinued or temporarily out of stock] are all great resources. I tried my hand at carding some with Hand-Dyed Blue Face Leicester Wool Fiber color 0010 (Ruby) and felted, spun and knit a little sample. I love the textural effect, and though I like the overall final color, I must admit I played it a little safe by blending it with similar colors in the wool. On my next attempt at carding I think I’ll get out the Color Grid by Kangaroo Dyer and stretch myself to work outside my usual color comfort zone. The color grid is such a helpful tool for identifying just the right color to add a spark of life to your project. Felters, get ready for some fun. 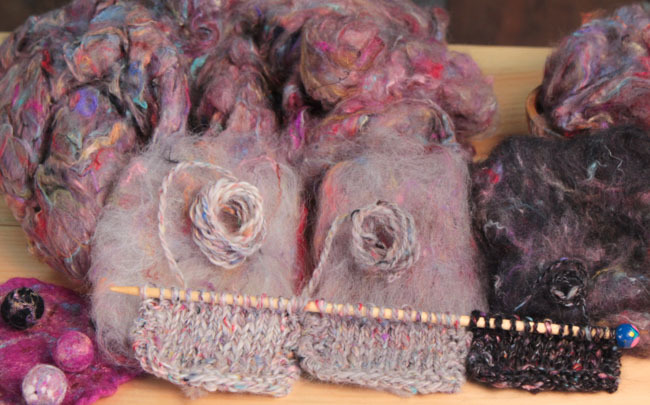 The demi-carded silk bundles are perfect for creative uses in felting to achieve visual and textural interest. 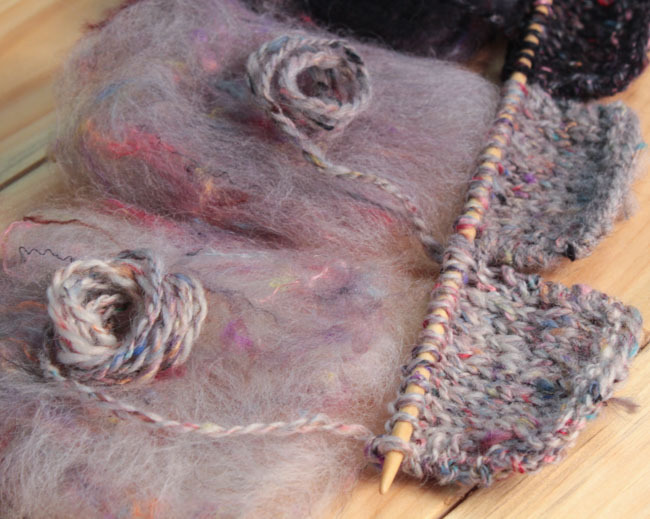 Create a masterpiece by taking advantage of long strips of vivid colored fiber to highlight your wet felted projects. My mind is racing with ideas. Hum, I can see using thin, long layers in my nuno felted scarfs (love how the silk transforms as the wool shrinks in). I can’t wait to use it in felted vessels and I’m also thinking of some non-traditional felted “rope” as well as using it in felted jewelry. I best get started because there’s alot to make. Silk bundles are approximately 5-6 ounces. Available in 3 shades: white Demi-Carded Silk Bundles color 0010 (white), rose/antique gold Demi-Carded Silk Bundles color 0020 (rosegold), turquoise/blue/green Demi-Carded Silk Bundles color 0030 (bluegreen). To dye your own use wash fast acid or country classic. *It is not uncommon to have some excess dye present in the dyed bundles. Be careful when felting with highly contrasting colors and make sure to fully rinse completed projects. The easter bunny will be hop, hop, hoppin’ along before you know. 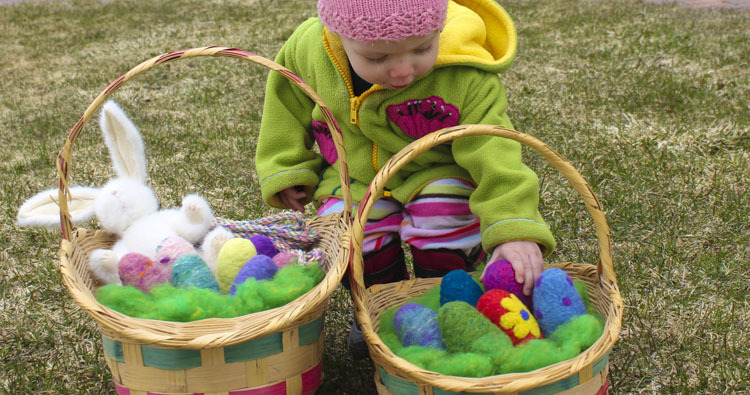 Why not have a little easter fun with the kids and make your own felted easter eggs. Both wet and needle felting, depending upon your preference, work great for this project.